Grass is greening up nice, we have daffoldils and crocus and other stuff blooming. The local ice cream shop opened up foir spring several weeks ago, and have been snowed on a couple times, but people line up anyway. I guess they're missing the ice cream, but also just the idea of being outside in the sunshine after work. Going up to the farm this weekend, for more tilling, more brush clearing, maybe some more planting. Will meet with a solar panel installer, just to show him the place, we won't move on that this year, but mabe next year. We'll see how the roofing and other priorities go first. Here is an older photo from another early spring. This was a screened culvert at the outlet from a wildlife sanctuary. 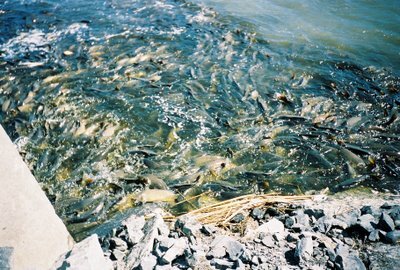 The carp were all crowding around, wanting to get out of the murky river in to the clear, warming wetland the water is flowing out of. I'm glad they are keeping the carp out.